Driving along in Northeast Ohio, I came around a bend in the road and saw some tall weeds with clusters of white flowers in the roadside ditch. The flower heads had the classic shape of the Apiaceae or carrot family with the typical “compound umbels” on display. Think of an upside down umbrella with all the flower clusters radiating upward from a single point end of the stalk to form a flattened flower head about 6-10” across. So, I just had to stop and look at these plants knowing the concern that they will incite when people panic because they think they are seeing giant hogweed overrunning the county! It was as suspected, cow parsnip (Heracleum maximum syn. Heracleum lanatum Michx) and sometimes called Indian celery, Indian rhubarb, American cow parsnip and common hogweed. Cow parsnip is a native, biennial plant, so during the first year it exists as a basal rosette of leaves; subsequently, in its second year, it produces a flower stalk that may grow to about 5-6 feet in height. The flower stalk may be slightly ridged and can be sparsely or very hirsute (hairy). There appear to be large swollen regions on the stem, some the size of a baseball or larger. These swollen areas are merely a sheath or covering that will split open to reveal both leaves and developing flower rays and umbels. Eventually the flower umbels will expand and emerge above the leaves, creating the characteristic flattened flower head of the Apiaceae (Carrot) family. The inflorescence or flower head is a broad, flat-topped, terminal umbel typically 4-12″ across but may be up to 16″ in diameter; ultimately composed of 15 to 30 umbellets, but up to 45 umbellets may occasionally be observed. The leaves of cow parsnip are quite large, up to 16-19” in length overall and range from 12-19” wide. Leaves are alternate, palmately compound with three leaflets attached to a petiole, with the terminal leaflet typically larger than the two basal leaflets. The leaves have large serrated, coarsely toothed, rounded lobes rather than the more deeply cut, pointed lobes found on the leaves of giant hogweed. The real concern is that cow parsnip can cause skin irritations ranging from a mild rash to severe blistering. Cow parsnip sap, like that of its cousin, the real giant hogweed, contains furanocoumarins. These are phototoxic chemicals, whose compounds are activated by exposure to ultraviolet rays in sunlight. If the sap gets on skin, and then exposed to sunlight, it can cause a blistering, itchy rash. Skin reactions caused by furanocoumarins on sensitive individuals may take a long time to heal, sometimes months, and may even leave scars. 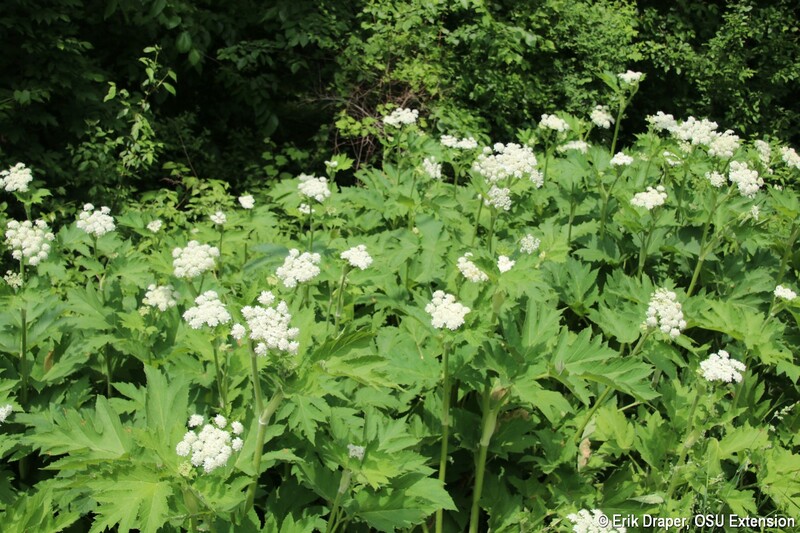 While cow parsnip is considered to be not as toxic as giant hogweed, much like its smaller relative the wild parsnip, which Joe Boggs wrote about earlier, it can still cause painful, nasty burns on exposed skin. So, before you hike, run through or whip weeds that are as tall as you… look around carefully and MOOOve with caution! !